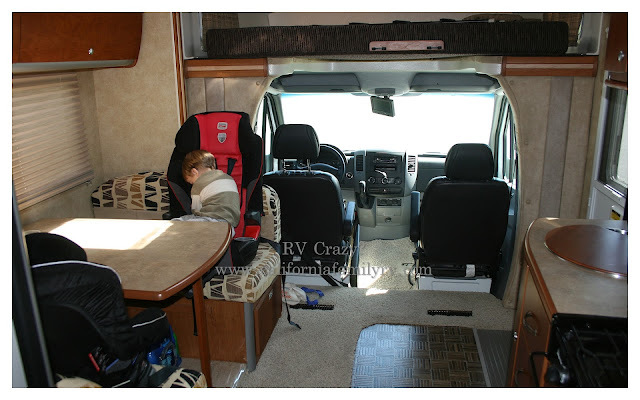 One of our biggest challenges when rv-ing with three kids is water conservation. We teach our kids how to use water conservatively, but we still want them to practice good hygiene. And with 5 people, and one little rv, that means we use our water tank up quickly. Being new to rv-ing, the first thing I had to learn was where the water from each faucet, shower, toilet came from and went. All of the water that comes out of any faucet, shower or toilet in our rv comes from the fresh water tank. Being conservative with your use of this is a good thing! If you are finding that you're using up your fresh water tank too quickly, here are a few tips. 1. Wash hands quickly. You only need a tiny bit of soap. 3. If there is a clean water spigot nearby, use this for dish-washing instead of your rv water. You can purchase a dishpan like this one: collapsible dishpan I love this pan because it fits inside of my rv kitchen sink. So I can fill it at the spigot and bring it inside to wash dishes. Or if it's not too buggy and you eat outside, you can wash dishes out by the campfire. We also encourage the kids to use the outside spigots for washing hands as needed while they're playing outside. 4. Use baby wipes with a little dish soap on them to pre-clean extra dirty dishes or pots/pans. This will save you a LOT of water, especially when you have a meal like spaghetti or ribs. 5. Have your kids help you fill the tanks. Seriously. Let them help you fill an extra water container and try to lug it back to your rv. Teach them how to siphon it into your rv. And then have them keep track of how quickly it is used. We did this with our kids on one of our early trips and it really made them more aware of how heavy the water is, and how difficult it is to re-fill the tanks. ALL of us were more conservative both while rv-ing and at home after a few trips. It's really eye-opening. The water that we use empties into two different tanks, the grey or the black. In our rv, the kitchen sink and shower empty into the grey tank. The toilet and bathroom sink empty into the black tank. Knowing where your water goes, helps you to conserve more appropriately. If I find our grey tank is filling quickly, I will wash dishes in my dishpan, then empty the used water either in our firepit, or in our black tank (by pouring down the bathroom sink). If we find the black tank is filling quickly (this almost never happens to us), we can wash hands in the kitchen sink instead of the bathroom. Managing our water usage and tank fill levels really saves us from having to move the r.v. to dump so often, and we're ALL happy with that.